Did you ever wonder about the Camino to Santiago in Medieval times? and how pilgrims from overseas made their journey to Compostela? along the English Way from the UK or Ireland for instance? Esther Taboada is a journalist and photographer from Galicia. She lived in Ireland for a few years where she worked as an archaeologist in various excavations around the country. During her time as an archaeologist, Esther took stunning pictures in various sites but we particularly love the pictures she took of a Medieval settlement site in Ardreigh, Athy, County Kildare. 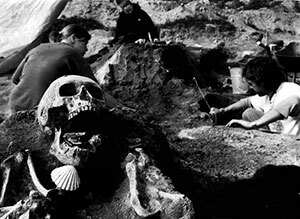 “There was as well a wide variety of archaeological features found, and according to the analysis of their remains, it was possible to see what kind of lives they lived, what kind of diets they had, what illnesses they endured and for some it is possible to tell how they died. Several Jacobus shells were found among all these remains. 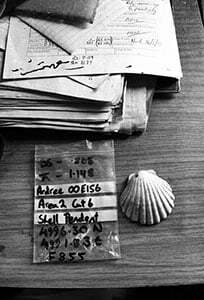 As far as I know two other shells were found in the previous excavation phase and probably more in the following one,” she explains. 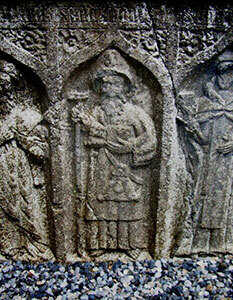 The cult of St James was very popular in late Medieval Ireland, as archaeologist and Medieval Pilgrimage specialist Louise Nugent, from Pilgrimage in Medieval Ireland, explains. Given the long distance from Ireland to Santiago and the requirement to travel part of the journey by boat, a pilgrimage to Santiago de Compostela from Ireland was very expensive. Historical sources seem to indicate that the majority of Irish pilgrims travelling to Santiago were from the upper echelons of Irish society. Pilgrims would have embarked from a variety of Irish ports such as Drogheda, Dublin, Wexford, New Ross, Waterford, Youghal, Cork, Kinsale, Dingle, Limerick and Galway (Stalley 1988, 398). “St James was a saint that appealed to both the Gaelic and Anglo Norman parts of Irish Society . Dedications to the saint are found all around the country. Typically it was the aristocrats who have the money to go on a pilgrimage to Santiago and there are a number of pilgrimages recorded in the Irish annals and state documents. One such pilgrim was the Mayor of Waterford James Rice who twice made the pilgrimage to Santiago de Compostela, first in 1473 and again in 1483. On his second pilgrimage in 1483 he was accompanied by two bailiffs or city councillors, Patrick Mulligan and Philip Bryan and there are records surviving of letters from him to the government to ask permission to go on pilgrimage,” Louise tells us, indicating also that people in office would have to ask permission to go on a long distance pilgrimage. This journey was re-enacted in 2008. Souvenirs purchased by medieval Camino pilgrims to Santiago have been recovered by archaeologists all across Europe, including Ireland. 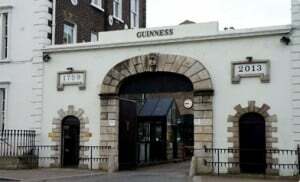 Saint James Gate in Dublin 8 was a traditional starting point for pilgrims setting sail from the Dublin area, on their way to Santiago de Compostela. Pilgrim passports were stamped here before heading on their Camino de Santiago journey. Traditionally they would have landed in the northern ports of Galicia and other regions in Spain, mainly the cities of A Coruña and Ferrol (today the two main starting points for the English Way to Santiago), but also from smaller ports along the north coast. This tradition still persists and Irish pilgrims can obtain their pilgrim passports (credenciales) from the Irish Society of Friends of Saint James founded in 1992, as well as get their pilgrim passport stamped at St James Church nearby. Hi Colleen, thank you for your comment. There are many different Camino routes and we can tailor to the amount of time you have available. The most popular is the French Way from St Jean to Santiago and this will take a minimum of 34 days to complete the whole route. You could opt to walk the last 100km of the route, from Sarria to Santiago, which would take one week. The amount of money required depends on how you wish to do the trip. I will pass on your details to our customer care team who will get in touch directly to advise on a route to suit. Kindest regards, Lisa. How long would this journey take, and how much money wound be required. Any extra info you could on? Hi Bridie, thank you so much for your note. The CaminoWays.com passport included with your holiday pack should be enough for the whole trip as it has space for 48 stamps (only 1 per day required if starting in St Jean). You can also obtain pilgrim passports in Ireland from the Irish Society of Friends of St James (www.caminosociety.ie) and from St James Church in Dublin. I hope this helps! let us know if you have any more questions. Kindest regards. There are 10 of us doing the Camilo from France St jean we would like to know if it is advisable to apply for the long passport as we intend to carry on in our subsequent visits.